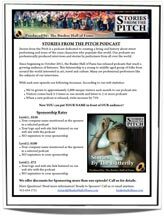 If you’re interested in becoming a sponsor for The Stories from the Pitch podcast, we’d LOVE to hear from you. Step one – download the sponsorship sheet we put together which shows some options. Step two – get in touch with Richard Renner to discuss which option works best for you. Step three – sit back and enjoy the awesomeness you’re helping to create! Huge thanks to the organizations and people who have helped us thus far! We REALLY appreciate your support! August 1, 2017, Dolphin Creative came onboard a second time to sponsor nine consecutive episodes. This was HUGE as could once again focus on creating and delivering the living oral history about street performing and some of the crazy characters that populate this world! Stuart Every and his team in Dubai are doing an incredible job of bringing Street Theatre to the Middle East and supporting this style of performance where ever it takes place! To find out more please visit DolphinCreative.org. On March 15, 2017, BuskinCity came on board for a 5 episode sponsorship deal for which we are extremely grateful! If you haven't head of this program, BuskinCity is a platform for professional street performers to book their own tour in different parts of the world using a simple booking calendar. Find out more and become a part of this incredible resource at: http://BuskinCity.com. December 4, 2015, The Busking Project launched their all new "Busk" Smart Phone App and to help celebrate the 8 month journey that it took to build this Smart Phone App, they sponsored Peter Panic's Bio Episode to help get the world out. Click on the links to learn more about The Busking Project or to download Busk from the iTunes Music Store. August 1, 2015, Dolphin Creative came onboard to sponsor nine consecutive episodes. This was HUGE as we stopped having to worry about where the money was coming from and could focus on creating and delivering the living oral history about street performing and some of the crazy characters that populate this world! Stuart Every and his team in Dubai are doing an incredible job of bringing Street Theatre to the Middle East and supporting this style of performance where ever it takes place! To find out more please visit DolphinCreative.org. July 1, 2015 - The Bottom Line Productions came on board to sponsor Episode 58 of the Stories from the Pitch Podcast, a special Canada Day episode that featured Vancouver-bsed performer, Byron Bertram. 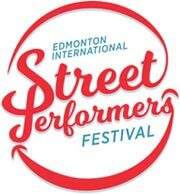 Longtime publicity company in charge of promoting, The Edmonton International Street Performers Festival, we're delighted to have them join our team of sponsors! 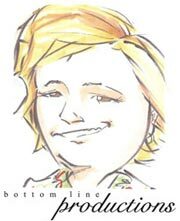 Find out more about Bottom Line Productions at: http://bottomlinepro.com. June 1, 2015 - The Edmonton International Street Performers Festival signed up to sponsor the 2015 Busker Hall of Fame Inductee, Gazzo's Bio-episode. The Festival takes place in Edmonton, Alberta Canada and is one of the longest running festival of it's kind in North America. Find out more about the festival at - edmontonstreetfest.com HUGE thanks to them for sponsoring Episode 57 of the Podcast! 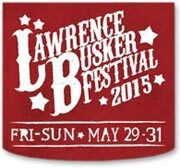 May 4, 2015 - The Lawrence Busker Festival signed up for a second episode sponsorship. The Festival takes place in Lawrence, Kansas and is one of the largest gatherings of street performers in the United States. Find out more about the festival at - Lawrencebuskerfest.com HUGE thanks to them for sponsoring Episode 56 of the Podcast! July 15, 2014 - ideality.com inc. became the second Episode Sponsor for the Stories from the Pitch Podcast. This company is a dream brokerage that’s helped turn aspirations into reality for 20 years. They’re Texas grown and Austin based and ready to help you live your dream. 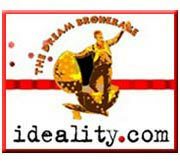 To find out more about their services visit - ideality.com on-line and HUGE thanks to them for sponsoring Episode 42 of the Podcast! 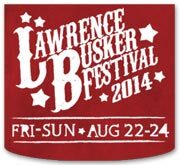 December 25, 2013 - The Lawrence Busker Festival became the first Episode Sponsor for the Stories from the Pitch Podcast . The Festival takes place in Lawrence, Kansas and is one of the largest gatherings of street performers in the United States. Find out more about the festival at - Lawrencebuskerfest.com HUGE thanks to them for sponsoring Episode 29 of the Podcast! April 22, 2013 - The Busker Hall of Fame received the AWESOME GRANT from the AWESOME FOUNDATION/AWESOME WITHOUT BORDERS.The $1000.00 grant allowed us to pay off many of the expenses we had incurred in our first year and a half of operation and was a really nice acknowledgement that what we're doing has value and is being appreciated!